This article contains facts and information about the life and times of the famous Native American Indian chief known as Gall. Who was Gall and why was this Native Indian chief famous? Summary: Chief Gall (c. 1840 - 1894) was guided by Chief Red Cloud and became an excellent military strategist. He joined the combined Native American forces of Chief Sitting Bull and played a major role as a leader in the Battle of Little Bighorn in 1876 - it was the greatest victory of the Native American Indians against the U.S. soldiers. The following fact sheet contains interesting facts, background history and information about the life of Gall and the events in history that led to his fame as a great Native American Indian leader. Gall was born around the 1840s near the Moreau River in South Dakota. Unfortunately, there were no reports about who his parents were. All that is known is he was an orphan growing up. In addition, as he was being groomed into a full fledged warrior, he also received several names. For example, the name Gall was given to him because when he was still a child, he tried to eat the gallbladder of an animal when he was out for the hunt and was very hungry. He was also named Matohinsa when he was growing up. This name meant Bear Shedding His Hair. His most popular name however was Pizi. Gall grew up under the Lakota tribe which was led by Red Cloud, and under his guidance, Gall was able to fight many epic battles during Red Cloud's attempts to hold the Powder River country for the northern tribes. This changed however when Red Cloud signed the treaty of 1868. Gall was one of those who were against the treaty and did not sign the document. As a result, he left the tribe who was under the chieftainship of Red Cloud. As a result, Sitting Bull adopted him into their tribe and from Lakota, Gall became a Dakota. Sitting Bull treated Gall as a brother and appointed him the military chief of the Dakota tribe which was under his leadership. Sitting Bull had confidence in Gall's abilities as a great planner and strategist. 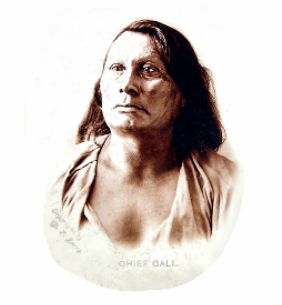 Gall was able to immediately seize upon any advantage and became the mainstay of Sitting Bull's war council. He consistently upheld his people's right to their buffalo plains and believed that they should hold the government strictly to its agreements with them. In the summer of 1876 the Native American Indians prepared for their biggest conflict with the US army. The trail to the Battle of the Big Horn began for Chief Gall when General George Custer sent Major Marcus Reno to attack his encampment along the Little Big Horn. The unprovoked attack on Chief Gall’s village on June 25, 1876 resulted in the deaths of several members of Chief Gall’s family. Gall went on to avenge the deaths and joined the forces of Sitting Bull. On 26 June 1876 the Battle of the Little Bighorn took place. The combined force of Native American Indians rode to attack General George Custer killing all of his 231 men including General Custer. The Battle of Little Bighorn became known as the greatest victory of the Native Americans against the U.S. soldiers. The stunned and angry reaction to the US defeat at the Battle of Little Bighorn prompted a massive outcry and the US government flooded the area with troops, forcing the Native American Indians to surrender or flee. Gall and Sitting Bull fled to Canada, but after five years of exile, he quarreled with his old friend and returned to the United States. Gall surrendered on January 3, 1881. Tired of fighting and living in exile Gall turned his back on the past and adjust to the new inevitable way of life. He settled to become a farmer, supported schools for Sioux children, was appointed as judge for the Court of Indian Affair, opposed the Ghost Dance movement, and accepted the treaty of 1889. Gall was eventually regarded with high esteem among many Americans who admired his courage, wisdom and honesty. He died at Wakpala, South Dakota, December 5, 1894. He was 54 years old. For additional facts and information refer to the legend and the Story of Gall. Discover the vast selection of pictures on the subject of the tribes of Famous Native Americans such as Gall. The pictures show the clothing, war paint, weapons and decorations of various Native Indian tribes, such as the Sioux tribe of Gall, that can be used as a really useful educational resource for kids and children of all ages studying famous Native Americans such as Gall. We hope you enjoy watching the video - just click and play - a great educational resource for kids.